We present Neural Image Compression (NIC), a method to reduce the size of gigapixel images by mapping them to a compact latent space using neural networks. 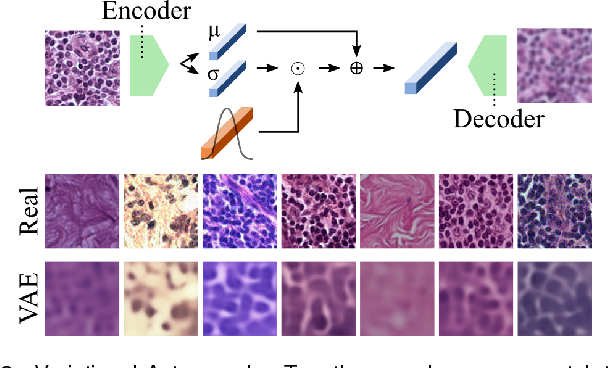 We show that this compression allows us to train convolutional neural networks on histopathology whole-slide images end-to-end using weak image-level labels. Stain variation is a phenomenon observed when distinct pathology laboratories stain tissue slides that exhibit similar but not identical color appearance. Due to this color shift between laboratories, convolutional neural networks (CNNs) trained with images from one lab often underperform on unseen images from the other lab. Several techniques have been proposed to reduce the generalization error, mainly grouped into two categories: stain color augmentation and stain color normalization. The former simulates a wide variety of realistic stain variations during training, producing stain-invariant CNNs. The latter aims to match training and test color distributions in order to reduce stain variation. For the first time, we compared some of these techniques and quantified their effect on CNN classification performance using a heterogeneous dataset of hematoxylin and eosin histopathology images from 4 organs and 9 pathology laboratories. Additionally, we propose a novel unsupervised method to perform stain color normalization using a neural network. Based on our experimental results, we provide practical guidelines on how to use stain color augmentation and stain color normalization in future computational pathology applications. Tissue segmentation is an important pre-requisite for efficient and accurate diagnostics in digital pathology. However, it is well known that whole-slide scanners can fail in detecting all tissue regions, for example due to the tissue type, or due to weak staining because their tissue detection algorithms are not robust enough. 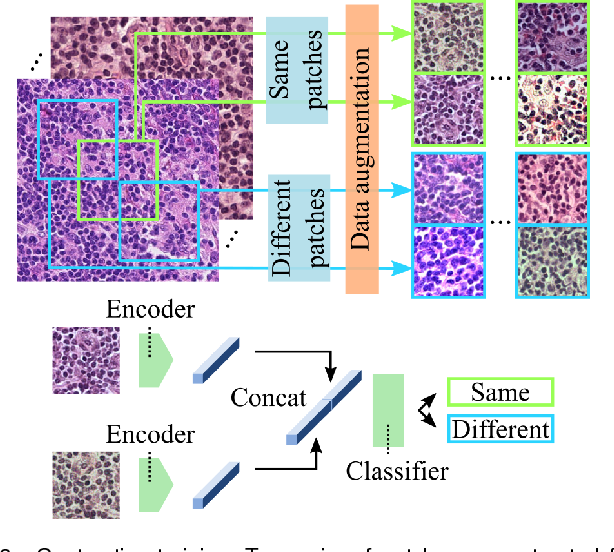 In this paper, we introduce two different convolutional neural network architectures for whole slide image segmentation to accurately identify the tissue sections. We also compare the algorithms to a published traditional method. We collected 54 whole slide images with differing stains and tissue types from three laboratories to validate our algorithms. 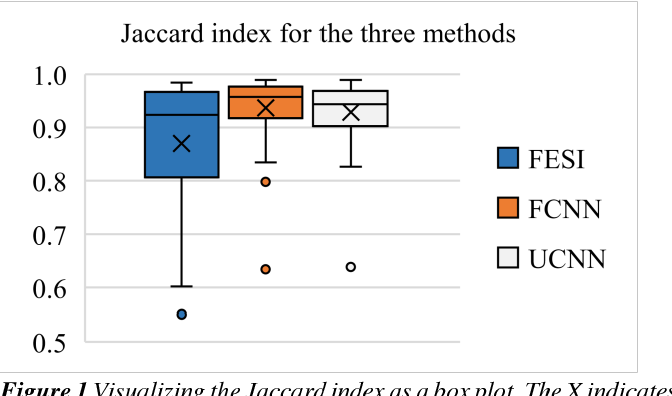 We show that while the two methods do not differ significantly they outperform their traditional counterpart (Jaccard index of 0.937 and 0.929 vs. 0.870, p < 0.01). 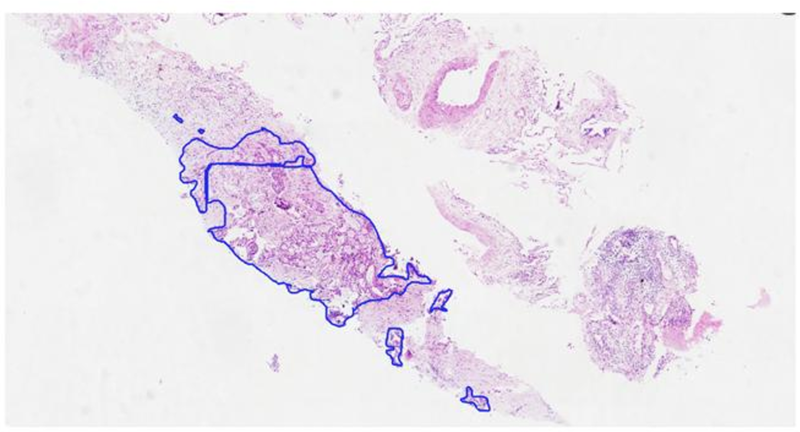 Automated classification of histopathological whole-slide images (WSI) of breast tissue requires analysis at very high resolutions with a large contextual area. In this paper, we present context-aware stacked convolutional neural networks (CNN) for classification of breast WSIs into normal/benign, ductal carcinoma in situ (DCIS), and invasive ductal carcinoma (IDC). We first train a CNN using high pixel resolution patches to capture cellular level information. The feature responses generated by this model are then fed as input to a second CNN, stacked on top of the first. Training of this stacked architecture with large input patches enables learning of fine-grained (cellular) details and global interdependence of tissue structures. Our system is trained and evaluated on a dataset containing 221 WSIs of H&E stained breast tissue specimens. The system achieves an AUC of 0.962 for the binary classification of non-malignant and malignant slides and obtains a three class accuracy of 81.3% for classification of WSIs into normal/benign, DCIS, and IDC, demonstrating its potentials for routine diagnostics. The anatomical location of imaging features is of crucial importance for accurate diagnosis in many medical tasks. Convolutional neural networks (CNN) have had huge successes in computer vision, but they lack the natural ability to incorporate the anatomical location in their decision making process, hindering success in some medical image analysis tasks. In this paper, to integrate the anatomical location information into the network, we propose several deep CNN architectures that consider multi-scale patches or take explicit location features while training. 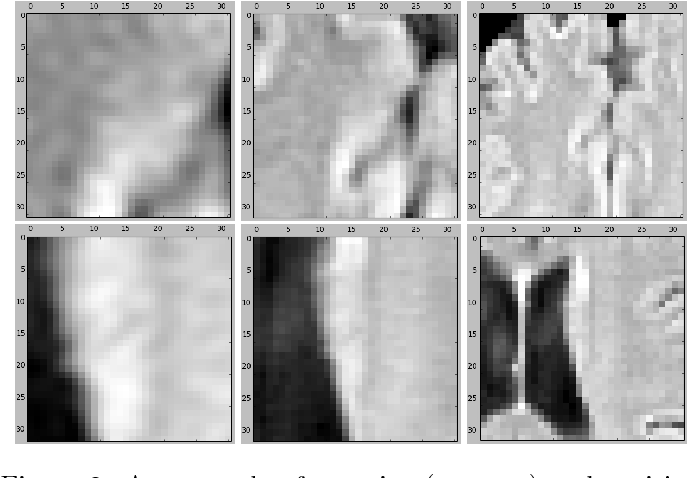 We apply and compare the proposed architectures for segmentation of white matter hyperintensities in brain MR images on a large dataset. As a result, we observe that the CNNs that incorporate location information substantially outperform a conventional segmentation method with hand-crafted features as well as CNNs that do not integrate location information. 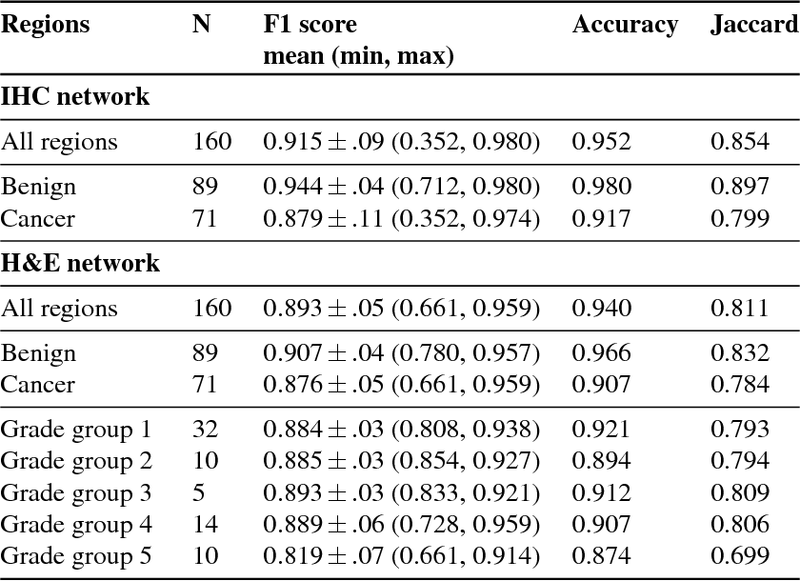 On a test set of 46 scans, the best configuration of our networks obtained a Dice score of 0.791, compared to 0.797 for an independent human observer. 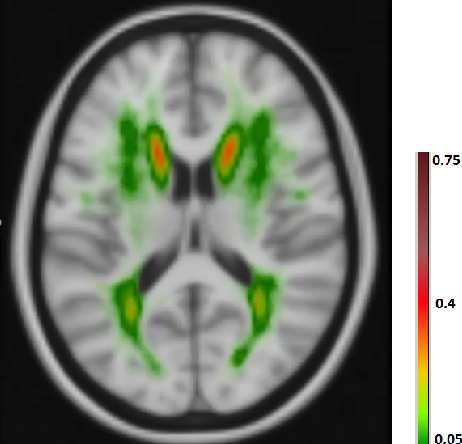 Performance levels of the machine and the independent human observer were not statistically significantly different (p-value=0.17). 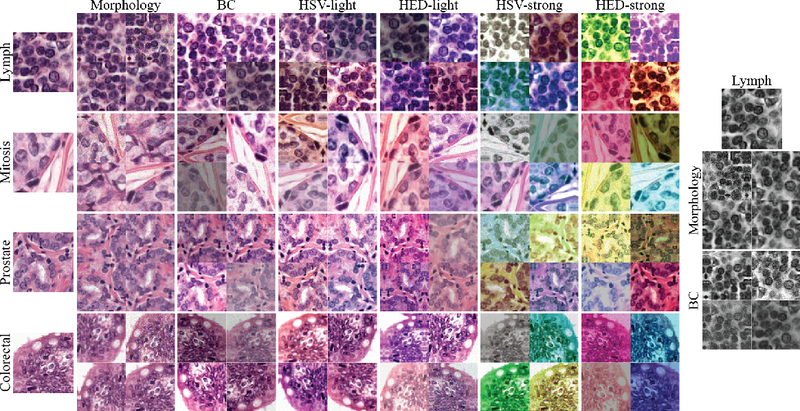 The development of reliable imaging biomarkers for the analysis of colorectal cancer (CRC) in hematoxylin and eosin (H&E) stained histopathology images requires an accurate and reproducible classification of the main tissue components in the image. In this paper, we propose a system for CRC tissue classification based on convolutional networks (ConvNets). 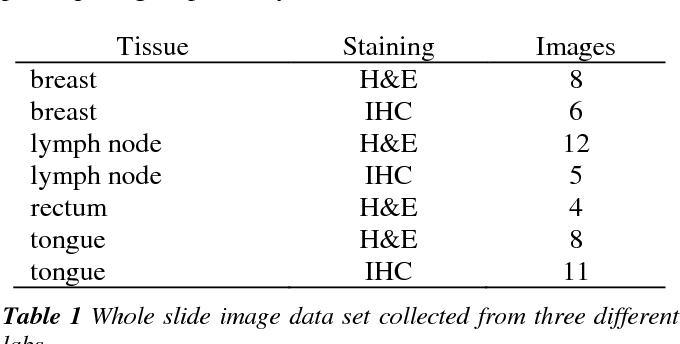 We investigate the importance of stain normalization in tissue classification of CRC tissue samples in H&E-stained images. Furthermore, we report the performance of ConvNets on a cohort of rectal cancer samples and on an independent publicly available dataset of colorectal H&E images. Aim: Early detection and correct diagnosis of lung cancer are the most important steps in improving patient outcome. This study aims to assess which deep learning models perform best in lung cancer diagnosis. Methods: Non-small cell lung carcinoma and small cell lung carcinoma biopsy specimens were consecutively obtained and stained. The specimen slides were diagnosed by two experienced pathologists (over 20 years). 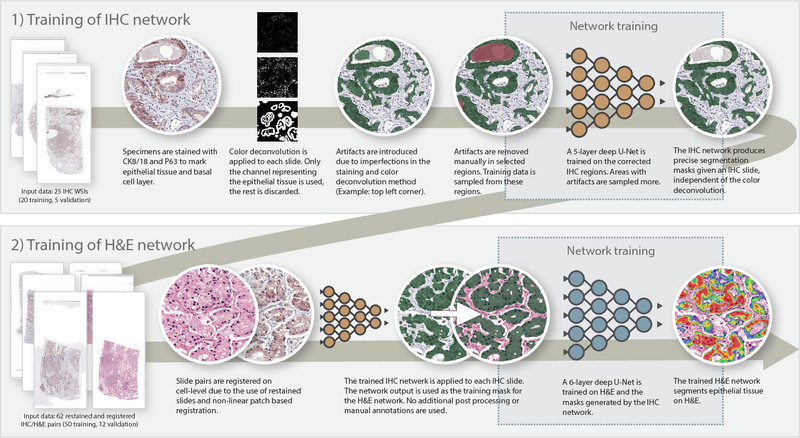 Several deep learning models were trained to discriminate cancer and non-cancer biopsies. Result: Deep learning models give reasonable AUC from 0.8810 to 0.9119. Conclusion: The deep learning analysis could help to speed up the detection process for the whole-slide image (WSI) and keep the comparable detection rate with human observer. Prostate cancer (PCa) is graded by pathologists by examining the architectural pattern of cancerous epithelial tissue on hematoxylin and eosin (H&E) stained slides. 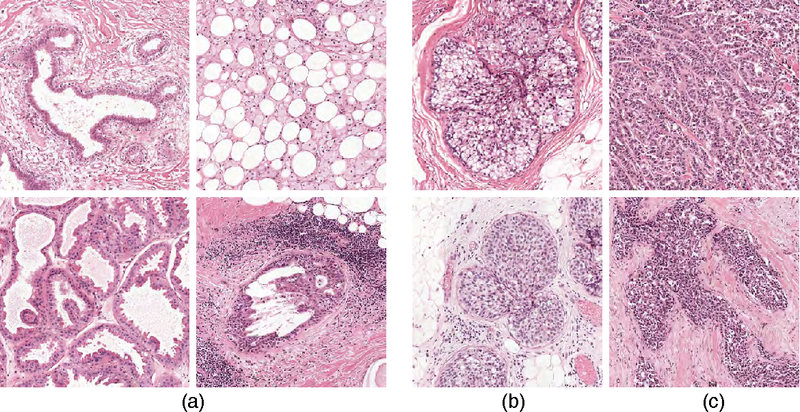 Given the importance of gland morphology, automatically differentiating between glandular epithelial tissue and other tissues is an important prerequisite for the development of automated methods for detecting PCa. We propose a new method, using deep learning, for automatically segmenting epithelial tissue in digitized prostatectomy slides. We employed immunohistochemistry (IHC) to render the ground truth less subjective and more precise compared to manual outlining on H&E slides, especially in areas with high-grade and poorly differentiated PCa. 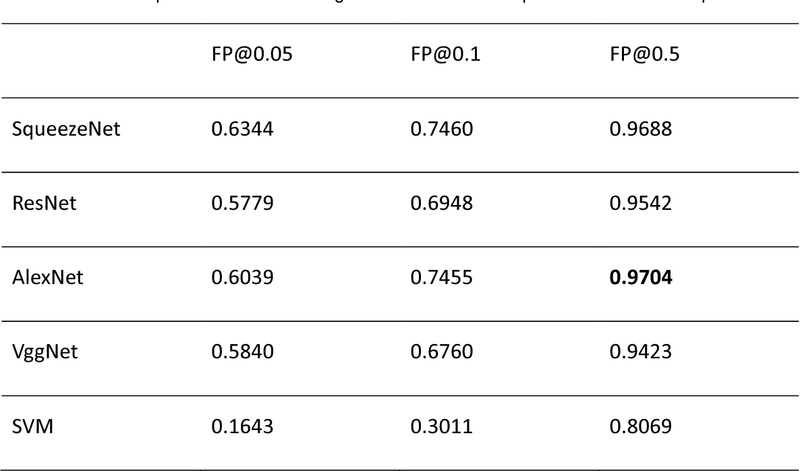 Our dataset consisted of 102 tissue blocks, including both low and high grade PCa. From each block a single new section was cut, stained with H&E, scanned, restained using P63 and CK8/18 to highlight the epithelial structure, and scanned again. The H&E slides were co-registered to the IHC slides. 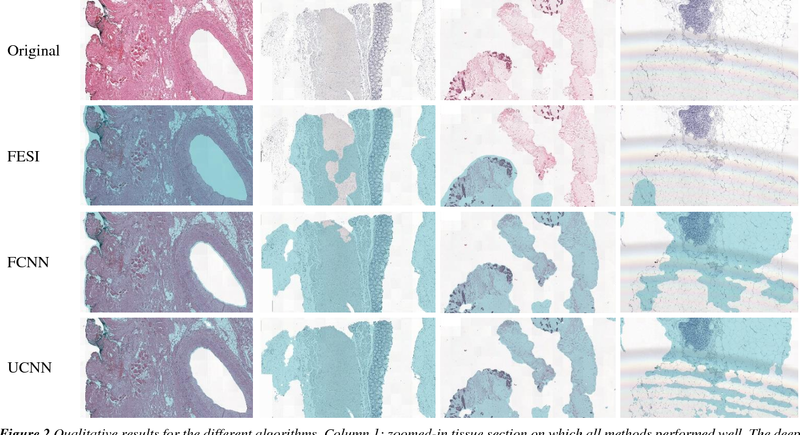 On a subset of the IHC slides we applied color deconvolution, corrected stain errors manually, and trained a U-Net to perform segmentation of epithelial structures. Whole-slide segmentation masks generated by the IHC U-Net were used to train a second U-Net on H&E. Our system makes precise cell-level segmentations and segments both intact glands as well as individual (tumor) epithelial cells. We achieved an F1-score of 0.895 on a hold-out test set and 0.827 on an external reference set from a different center. We envision this segmentation as being the first part of a fully automated prostate cancer detection and grading pipeline. Deep learning algorithms, in particular convolutional networks, have rapidly become a methodology of choice for analyzing medical images. This paper reviews the major deep learning concepts pertinent to medical image analysis and summarizes over 300 contributions to the field, most of which appeared in the last year. We survey the use of deep learning for image classification, object detection, segmentation, registration, and other tasks and provide concise overviews of studies per application area. Open challenges and directions for future research are discussed. Manual counting of mitotic tumor cells in tissue sections constitutes one of the strongest prognostic markers for breast cancer. This procedure, however, is time-consuming and error-prone. We developed a method to automatically detect mitotic figures in breast cancer tissue sections based on convolutional neural networks (CNNs). 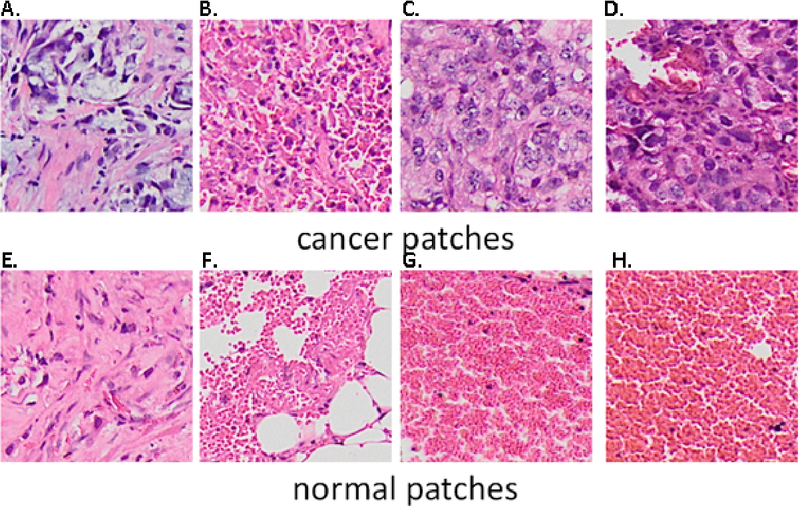 Application of CNNs to hematoxylin and eosin (H&E) stained histological tissue sections is hampered by: (1) noisy and expensive reference standards established by pathologists, (2) lack of generalization due to staining variation across laboratories, and (3) high computational requirements needed to process gigapixel whole-slide images (WSIs). 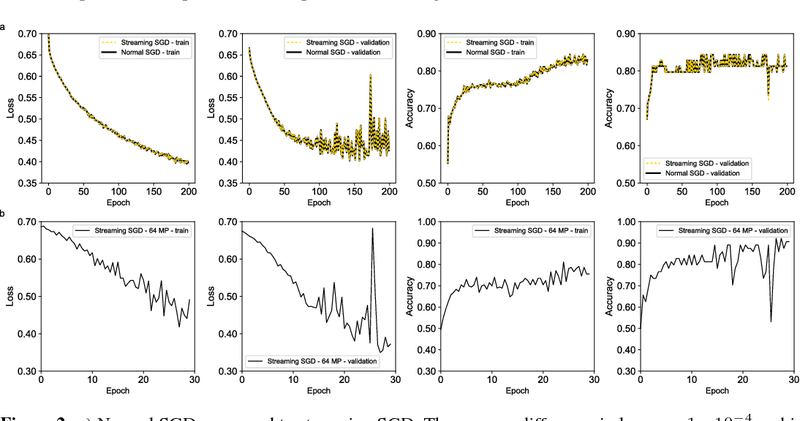 In this paper, we present a method to train and evaluate CNNs to specifically solve these issues in the context of mitosis detection in breast cancer WSIs. First, by combining image analysis of mitotic activity in phosphohistone-H3 (PHH3) restained slides and registration, we built a reference standard for mitosis detection in entire H&E WSIs requiring minimal manual annotation effort. Second, we designed a data augmentation strategy that creates diverse and realistic H&E stain variations by modifying the hematoxylin and eosin color channels directly. Using it during training combined with network ensembling resulted in a stain invariant mitosis detector. Third, we applied knowledge distillation to reduce the computational requirements of the mitosis detection ensemble with a negligible loss of performance. The system was trained in a single-center cohort and evaluated in an independent multicenter cohort from The Cancer Genome Atlas on the three tasks of the Tumor Proliferation Assessment Challenge (TUPAC). We obtained a performance within the top-3 best methods for most of the tasks of the challenge. Semantic segmentation of medical images aims to associate a pixel with a label in a medical image without human initialization. The success of semantic segmentation algorithms is contingent on the availability of high-quality imaging data with corresponding labels provided by experts. 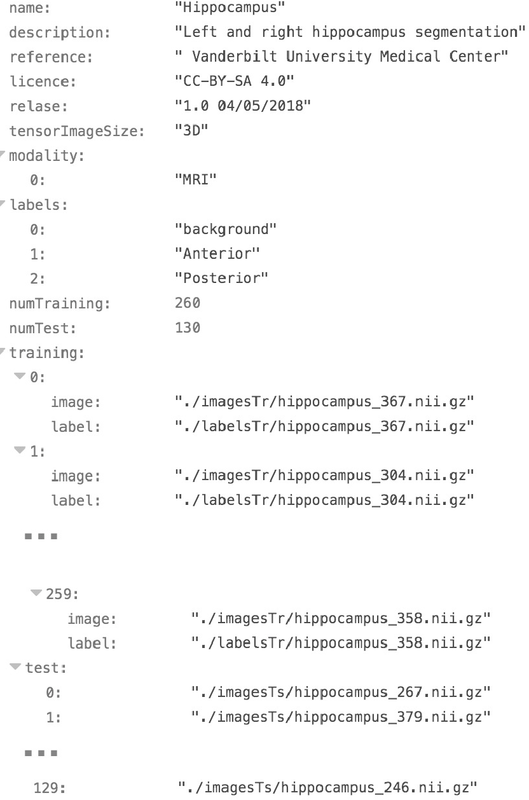 We sought to create a large collection of annotated medical image datasets of various clinically relevant anatomies available under open source license to facilitate the development of semantic segmentation algorithms. Such a resource would allow: 1) objective assessment of general-purpose segmentation methods through comprehensive benchmarking and 2) open and free access to medical image data for any researcher interested in the problem domain. 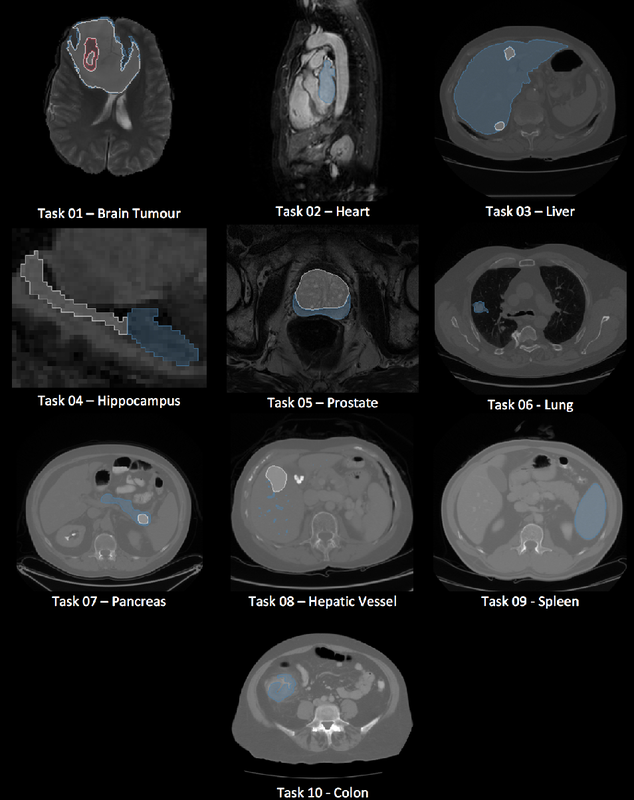 Through a multi-institutional effort, we generated a large, curated dataset representative of several highly variable segmentation tasks that was used in a crowd-sourced challenge - the Medical Segmentation Decathlon held during the 2018 Medical Image Computing and Computer Aided Interventions Conference in Granada, Spain. Here, we describe these ten labeled image datasets so that these data may be effectively reused by the research community.